"I've been living like a leper, accused of treachery to my king. When I've cleared my name I'll go back to him, not before." In AD 1192, there is trouble in the realm. The king of England, Richard the Lionhearted, is imprisoned in Austria after fighting his crusades and there is ransom to be paid for his release. His brother John collects from the taxpayers, but has his own eye on the English throne, even at the expense of his sibling. Having formed an alliance with the Templar Knights of Normandy, John pursues his own glorification in the eyes of the people, as the Norman influence stains his country. In the house of the Saxon Lord Cedric, a wedding is ordained. His son, Wilfred of Ivanhoe, is rumored to have betrayed his king, and Rowena, the woman who loves him, is now betrothed to the Lord Athelstane against her wishes. But on the night of their engagement, the feast is interrupted with the arrival of Brian de Bois-Guilbert, the Norman who apparently witnessed Ivanhoe's betrayal. In the shadows is another stranger, one who knows the truth about what happened in Europe, and one who must clear his name before he can face his father. Another traveller arrives at the supper, Prince John's accountant Isaac, a Jew, whose presence is mocked by the Normans who plot to kill him for the purse he carries before the night is done. Only the stranger can save the man from certain death, a debt that shall be repaid in armor. As part of John's plans for winning over the people, he hosts a test of chivalry, pitting the Normans against the Saxons in competition. The Templars are seasoned warriors, having just returned from ravaging Palestine, and have no trouble besting their Saxon adversaries, save for one knight, who bests them all. His victory is not without cost however, and it is only the healing hands of Isaac's daughter Rebecca that save the man's life. Another has his eye on the Jewess, and the forests abound with treachery, as a black knight appears in their midst. The throne of England is at stake, as opposing forces collide in the English countryside. Ivanhoe, penned in 1819, is a classic tale of honor, treachery and betrayal. Its author, Sir Walter Scott (1771-1832), began his career as a balladeer, gaining immense popularity with his works The Minstrelsy of the Scottish Border, The Lay of the Last Minstrel (1805), and the six canto The Lady of the Lake (1810), which Franz Schubert set to music as Ave Maria. He turned his hand to novels when competition from Lord Byron meant a decline in his popularity, creating a new genre of historical adventure with Waverly (1814) which, like its successors, was published anonymously. He had become one of the dominant forces in English romanticism. This five-hour screen adaptation captures much of the complexity of Scott's work, with its interwoven plots and subtexts: the dishonored knight, bent on redeeming his name; the conspiring Prince, set on claiming his brother's throne; the love of two women, Rowena and Rebecca for a man neither can have; and the vindictive obsession of Templar, who would forsake his own life for one woman's affections. The staging is impressive, steeped in the atmosphere of this dark and dirty time. The acting is believable, capturing the mood of the period, and each player adds to the character, either through humor (like Ralph Brown's Prince John) or seriousness (Christopher Lee's Lucard de Beaumanoir). Special mention must be made of Susan Lynch as Rebecca and Ciar�n Hinds as the evil Brian de Bois-Guilbert. While the tale revolves around Ivanhoe, Steven Waddington spends most of the film as an injured prisoner, not the stoic knight one might expect. There is plenty of action and intrigue, and the story is engaging. For fans of chivalrous adventure, Ivanhoe makes an entertaining watch, but may be better suited as a rental for most. Image Transfer Review: Image quality is what I've come to expect from A&E's mini series sets, which is less than ideal. Colors are somewhat muted and murky, and often seem to have a yellow cast to them. Things are a bit on the dark side, especially interiors, and the overall look is soft, lacking clarity and definition. There is no print damage to speak of, and there is only a bit of aliasing as well as compression artifacts in backgrounds or wall textures. For a period piece with such attention to set and costume design, there is a fair bit of room for improvement before I would consider it worthy of the subject. Audio Transfer Review: Stereo audio is presented well, with good use of directionality and no outstanding technical deficiencies. Dialogue is easily discernable, tone is even with no excess sibilance, and there is some low-end content. Overall, this is what I would expect from a quality miniseries of this era. Extras Review: The lone extra is a reasonable Sir Walter Scott biography/bibliography, duplicated on both discs. 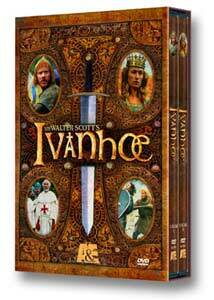 Ivanhoe is an engaging period drama, infused with appropriate humor, plenty of knightly action, intrigue and conflict. The acting is very good all around, the pace is consistent, and the story is executed with style. The only thing detracting from a buy recommendation is the less-than-stellar presentation of the video. Period buffs will want to own it, but more casual viewers will enjoy it as a rental.